As the BAT Program Coordinator, Ellen is involved in a wide range of requests relating to BAT: CBATI applications, BAT seminars and general communication on all things BAT-related. Ellen is responsible for ensuring the CBATI applicants’ Practical Skills Assessments are thoroughly evaluated and handles communication channels during the process. Her role within the BAT organization also includes helping with participants’ organization at the certification courses and there’s a high probability you will find her assisting at a CBATI course here or there. Ellen began her career in dog training by volunteering at the Los Angeles County Animal Shelter in Agoura Hills. It was here that she experienced first hand the tremendous variety of breeds, dispositions, and behavior issues. She also realized how just a little bit of training could have a huge impact on the dog and their future families. Inspired by the transformations at the shelter, Ellen soon began devoting her career path to working with dogs on a professional level. She became a Certified Behavior Adjustment Training Instructor (CBATI) at the very first course offered in 2012. As a CBATI, Ellen helps families throughout the greater Los Angeles area while mentoring other trainers within her local area. 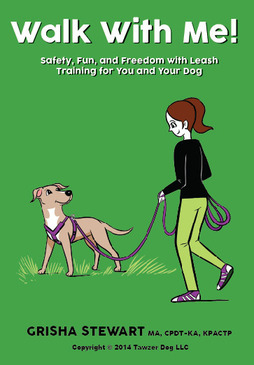 She is also a Certified Professional Dog Trainer-Knowledge Assessed (CPDT-KA). She lives in San Pedro, California with her adopted foster dog, Skittles, and her partner, Tony. If you have a BAT question, please use our contact form to get in touch with Ellen. These great trainers work with Ellen and me to review the Practical Skills Assessments that CBATI applicants submit to demonstrate their knowledge of BAT. Their evaluations are an essential part of the process in deciding whether the trainer's videos of BAT in action meets the high standards of a CBATI. 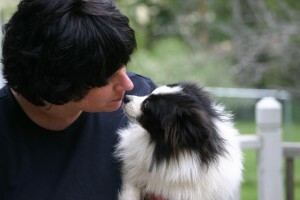 CBATI Jennie Murphy has been training dogs since 1990, both in a class situation and through private sessions. For the past 6 years, she has made the transition to totally positive training methods and for this she thanks her 8 year old German Shepherd, Lexi. The traditional compulsion based methods she had been using were making her dog more reactive and defensive. At the time, there were very few positive based training opportunities in her area so she began to search the internet for more humane methods to help in the rehabilitation of her dog. She began to use Leslie McDevitt’s Control Unleashed Program and saw positive changes. Through more on line studying, Jennie came across BAT and found it to be the missing link for her dog. In 2012 she signed up for the BAT Instructors Course in Westborough, Mass and in 2013, she became a certified Behavior Adjustment Trainer and started A Rock Solid Dog, her own training school,. She specializes in dogs that have reactivity issues, but also has a large clientele of dogs in need of learning every day manners. 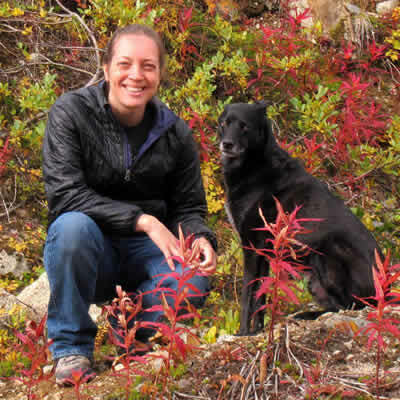 In addition to her private practice, Jennie is also an instructor with the Newfoundland Athletic Dog Association and teaches occasional classes with the Newfoundland Kennel Club. She is a Canine Good Neighbor Evaluator, a Fun Scent Games Instructor, and a member of NADA. She also volunteers with the city shelter providing training advice and working with the dogs in hopes to make them more adoptable. Jennie was recently hired by Canine Game Theory, an on line game based dog academy to make videos for their website, and she appears in Emily Larlham’s (known as Kikopup on YouTube) Dog Reactivity DVD where Jennie’s BAT training abilities were highlighted by a clip of her training her dog, Lexi. Jennie continues her education through learning opportunities such as Grisha Stewart’s Animal Building Blocks Academy, Karen Pryor Clicker Foundation Training course; Susan Garret's Recallers, Puppy Peeks, Nosework Courses and several classes with the Fenzi Dog Sport Academy. Most importantly, she is a lover of dogs and looks forward to helping trainers and clients reach the goals they’ve set forth with their dogs. Jennie lives in Newfoundland, Canada with her husband, Robert, son Colin and her two dogs, Lexi and Benny. You can check out A Rock Solid Dog at www.facebook.com/arocksoliddog to learn more and to contact Jennie directly for information on her private sessions and group classes. CBATI Jo Laurens has been working with people and their dogs since 2006, offering both 'regular' training and also behavioral work. Jo had been using BAT for a while, before taking the UK BAT Instructors' Course run by Grisha, in February 2014. This was the first BAT Instructors' course to cover the new BAT 2.0 material. Jo is a Registered Practitioner with the Animal Behaviour and Training Council (ABTC); a full member of the APDT (UK); and a full member of the Pet Professional Guild (PPG). Jo's background is firmly in clicker training, and she has attended many courses at Kay Lawrence's Learning About Dogs - gaining her CAP1 and CAP2 awards with Distinction. Jo is a proponent of force-free gundog training, and works and competes with her own dogs. 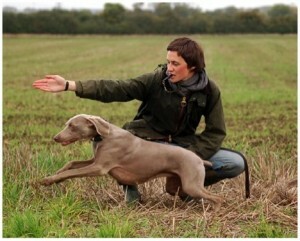 She is an Accredited Assessor for The Gundog Club (UK) and runs force-free gundog training classes. Jo runs DogWorks, an organization offering training and behavioral work - including a full spectrum of classes and behavioral packages. One of her favorite classes is the ongoing weekly group BAT class. Jo lives with her husband, Adam, and fur-kids Slate (Weimaraner); Grey (Slovakian Rough Haired Pointer) and Moye (black labrador)." 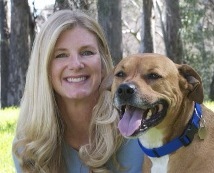 CBATI Lisa Walker has a passion for shelter dogs with behavior and/or medical challenges, and has privately rescued, fostered, trained and placed hundreds of homeless dogs over the last thirty years. Her deep understanding of the behaviors a rescued dog may bring into a new home inspired her to specialize in working with families who love and live with dogs who are fearful, anxious, or reactive, through her business Center for Canine Excellence in Freeport, Maine. She is a Licensed Presenter for Dogs & Storks® and Dog & Baby Connection™ programs, teaches training classes at the Animal Welfare Society in Kennebunk, Maine, and is an Approved AKC Canine Good Citizen Evaluator. Lisa attended Triple Crown Academy for Professional Dog Trainers, and is a member of the Pet Professional Guild, International Association of Animal Behavior Consultants, the Association of Pet Dog Trainers, and the Association of Animal Behavior Professionals. 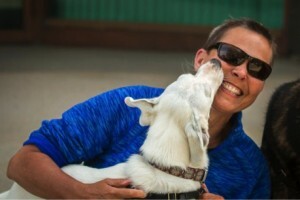 Dr. Nick Dodman, Tufts Animal Behavior Clinic, suggested Lisa try Behavior Adjustment Training with her own dog, Seguin, shortly after she rescued him. "BAT literally saved his life, igniting a desire to learn as much about BAT as I could to help as many dogs as possible." Lisa attended a BAT Seminar in RI and a BAT Instructor's Workshop in MA in 2012 and became a CBATI shortly thereafter, and was a Team Leader in BAT Instructor Workshops in 2013 and 2014. "BAT is a very valuable tool in my toolkit and has made the difference for many frustrated dog/handler teams." Lisa shares her home with Seguin (White German Shepherd Dog) and five more rescued dogs; Jill (Chow-X), Zoe (Wirehaired Terrier), Emmett (Dachshund), Ava Grace (Japanese Chin), and Hazel (Poodle). Her dog training business, Center for Canine Excellence, is based in Freeport, Maine. CBATI Viviane Arzoumanian has been training people and their dogs professionally since 2005. She learned about BAT in 2013, took the instructor’s course in October of that year, and became a CBATI. Viviane’s commitment to using gentle, fair and force free methods made BAT a “no brainer” and she loves the structure and language that Grisha has brought to this aspect of behavior modification for reactive and fearful behavior in dogs. She considers herself fortunate to have been able to serve as a team leader for two BAT Instructor’s Courses held in the Northeast. Team leading at that early stage allowed Viviane to experience BAT in its transition from 1.0 to 2.0. Viviane began her dog training studies with Pat Miller and continues her affiliation and advanced course education with Peaceable Paws. She also attends a variety of courses, seminars and online events to continue her education. Living and working in NYC, Vivane identifies with the training task an urban setting can create. She loves the challenge and the elegance of incorporating BAT techniques in this crowded city where dogs are so often overwhelmed. The pieces of BAT 2.0 that she can teach her clients have proven to be powerful even when executed in less than ideal circumstances. The nuanced underpinnings of BAT keep Viviane thinking and improving all the time. Viviane’s canine volunteer activities over the years have included participation in a HSUS relinquishment prevention program, offering pro-bono training services, and fostering two stray momma dogs and raising, then placing their litters of puppies. 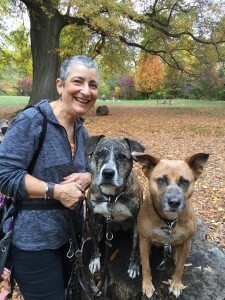 Viviane lives in Brooklyn with her husband of 32 years Greg, and their three dogs, all rescues: Toby an 10 year old Silky Terrier, Willow a 5 year old Heinz 57 mix (one of the momma dogs), and Willow’s daughter, Greta a 4 year old. Both of her grown daughters live in Brooklyn as well; Rachel is a dog a trainer and Elizabeth is in the hospitality industry. You can check out Viviane’s services at pumpkinpups.com to learn more and to contact her directly for information on private sessions and group classes.